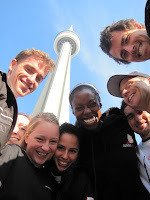 For a second time AthletesCAN - Canadian Olympians & National Team Athletes will scale the 1,776 steps of the second tallest building in the world, the CN Tower in the Embridge CN Tower Climb for United Way. This year, our team of athletes will be incredibly joined by our new Minister of Sports, Bal Gosal and Minister Lizon (MP for Mississauga-Cooksville). The significance of this climb cannot be understated. It is both a physical challenge and social challenge of supporting our community. United Way is an incredible charity who has relentlessly provided support for over 50 years to the community. The involvement and commitment of athletes to social responsibility is a beautiful demonstration of the power of sports – improving the community around us to make a better Canada through social responsibility. Every one of us has the power to positively impact the lives of others, no matter how small. Our team is committed to raising a minimum of $10,000. We will continue to fundraise until November 18, 2011, and encourage you to go online to support us. If you would like to sponsor me, please click the link below. Once you've made your donation using your credit card, you will receive an electronic tax receipt immediately. It's fast, easy, and secure! Committed to excellence and a better community with every step!